Pub on South End, serving Lebanese food. At one point in the past, this pub was called the Blacksmiths Arms photo. By August 2011 it had become The Edge photo. As of March 2014 it had one handpump for real ale. All the seating was either sofas or high stools. There was a small stage for live music. 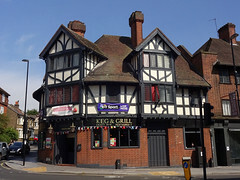 The Edge closed down in August 2017. As of October 2017 the premises were under refurbishment photo. EastLondonLines had previously reported that it would become a Lebanese-themed pub. As of early December 2017 it wasn't not quite open again yet, but had signage for Keg & Grill photo. Keg & Grill was open by June 2018. Last edited 2019-02-07 15:26:33 (version 32; diff). List all versions. Page last edited 2019-02-07 15:26:33 (version 32).